You ever buy artwork and wish that you could also have the subject of the painting? 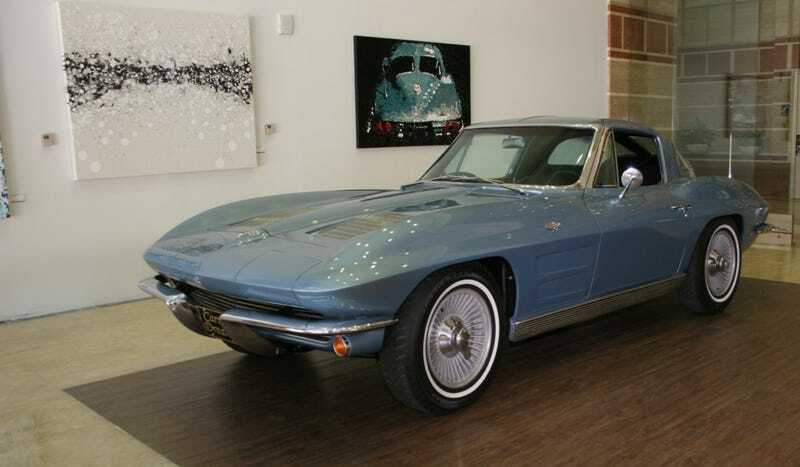 Well, if you buy this painting of a 1963 Corvette split window, you also get a 1963 Corvette split window. Sounds like a bargain at $150,000. Artist Timothy Raines (remember him?) partnered up with the DuPont Registry to offer this little duet. The car is a concours quality 1963 Corvette split window, which is the only year that the 'Vette had a split rear window, basically because it hampered rear visibility and that was an issue. Split windows are my personal favorite Sting Ray. I know they are really rare, but I also just really like the way the line of the roof continues onto the rear deck through the window. It feels more cohesive than the later cars. I'm not an art buff by any means, but the 'Vette looks pretty excellent to me. It's an "abstract expression" of the Corvette, so it isn't overly detailed but still has the essence of the car. The big question is, can you put the art in the back of the 'Vette and drive away with both? Or do you put both on a trailer?